Do you have a Family Project? When was the last occasion you and your family spent time together? Don’t tell me that you watched a movie at the PVR Cinemas and shared popcorns, only last week. Or you had a gala dinner at the Barbeque Nation, a month ago on a Friday night. Hold on. I am asking whether you did something together like a project. A family project I mean. The project could be trivial and simple but with a cause. The idea is to be together and enjoy – and cherish the moments that you will remember later. Given the machine life in the cities we live, we as a family seldom spend time together. We don’t think about or aspire to do something meaningful, exiting, creative and demonstrative for a cause. Life we live does not have a family fizz. Today each member of the family is busy with something – everybody is stressed out and lives a siloed life. We don’t have that family bond anymore that was perhaps there a generation before. Is this one of the reasons why we see growing frustration, leading to depression and disorders like schizophrenia? Few of my friends have recognized the need of a “family project”. I know a friend who takes his family to the mountains around Karjat. They spend two weeks in the tribal villages twice a year. His wife is a gynecologist, son is studying agriculture engineering and daughter is into development work at the TISS. Over the past five years, the family has supported a school, provided medical advice, improved farming practices and helped in building a market for the honey and handicrafts. 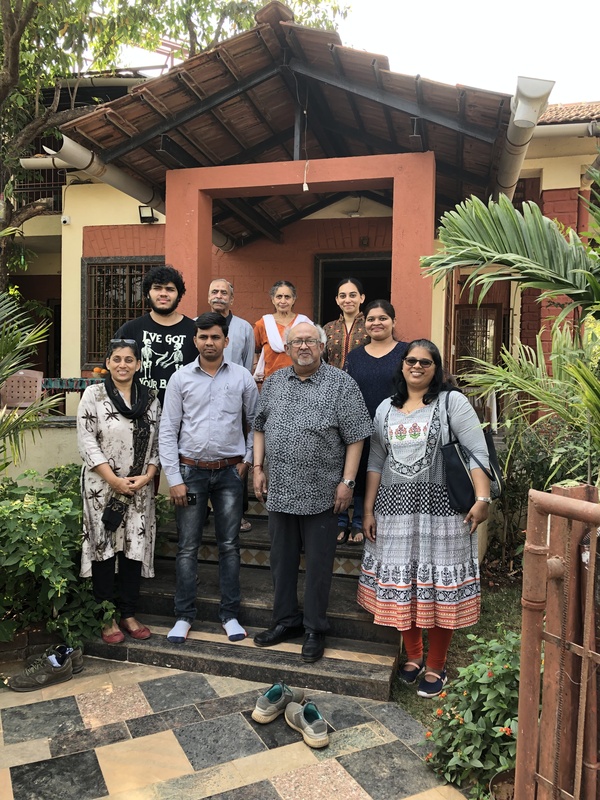 When I visit their place and the topic comes about Karjat, everyone gets excited to talk and tell me their experience, the challenges they faced and how they resolved them collectively. And when there is a slide show in the drawing room, showing me the “project”, on every slide there is fight who would tell the “story” first. I see there a resonance of emotions with all the enthusiasm. But as I said before, the “family project” can be even short and sweet. I remember when our children were young, we decided to spend an afternoon at a hobby pottery shop at the Atria Mall in Worli. 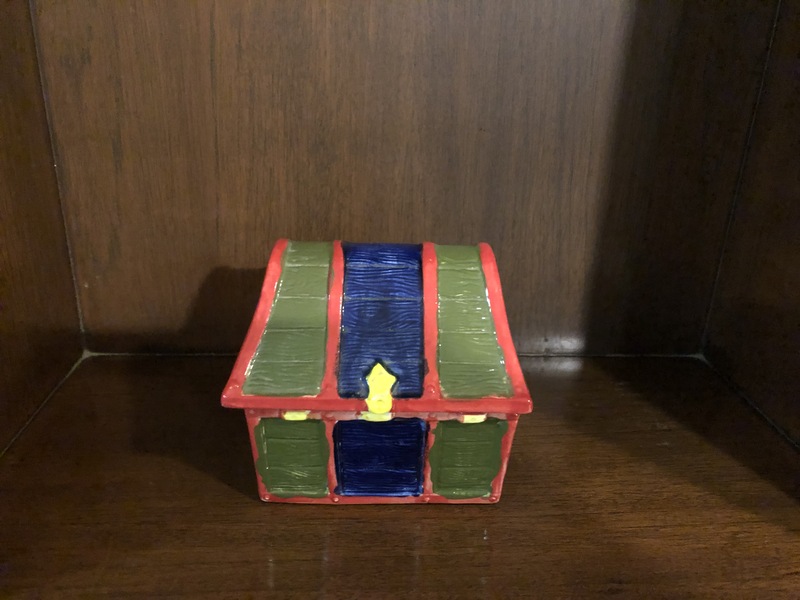 We four (my wife Kiran, daughter Devika and son Pranav) walked into the pottery shop in the mall in the afternoon and decided to make a house with clay. We were given clay, the “tools” and some glazing materials with bright colors. It took for us neat 3 hours to visualize and make a toy house with a roof that could be lifted to store the “secrets”. We discussed, shared the tasks, added value to each other’s work. Finally, the clay house was taken to the oven to bake. 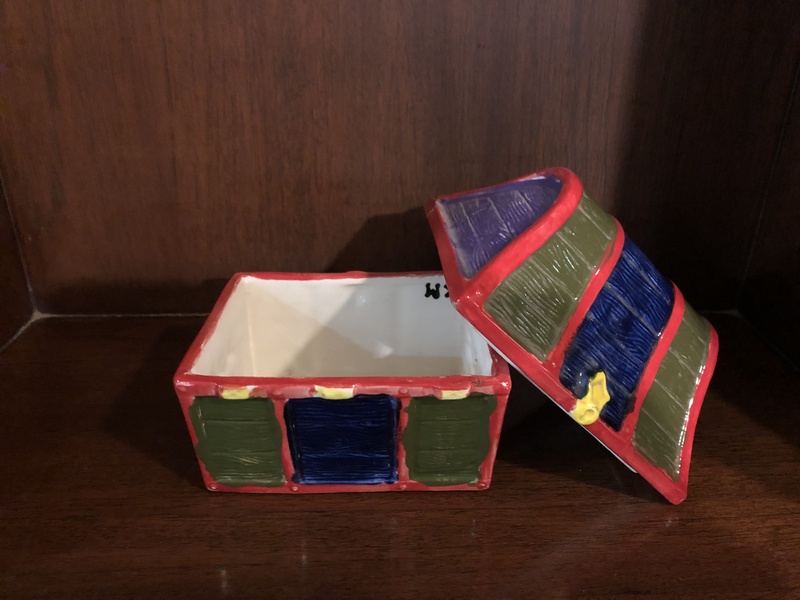 And when done, we were so thrilled to see that we could create something together – a lovely toy house (actually a storage box) with bright colors! We have preserved this work even today as a mark of us working together reminding us of all the joy and happiness. I think I understood my wife, son and daughter that afternoon much better. I spoke about the house that we “built”, and this reminds me of the wonderful visit me and my colleagues recently made to the Eco House of Dr Anjali Parasnis. Dr Anjali is Associate Director at TERI Western Zone office in New Mumbai. Few years ago, Anjali, her two sons and parents took up a “Family project” of building a Eco House near Khalapur, at the foothills of the mountains of Khandala near Mumbai. The family worked with all the passion, creativity and all the perseverance on this project. We were simply amazed to witness sustainability put into practice. The Eco House is a framed structure and for portion of the walls, it makes use of abandoned PET and beer bottles. The Jambha stone (laterite) is otherwise used that is porous. The foyer has lovely tile work made out of broken tiles what would have been otherwise thrown as waste. The kitchen has two sinks and a dual plumbing system is used that takes the sullage through a root zone treatment and then to a recharge pit to replenish the groundwater aquifer. Rainwater is tapped and channeled through to percolation area to charge the aquifer. Broken chassis of the vehicles are used for the lintels after cutting. Natural ducts through hollow walls are provided with options of forced circulation for cooling, cutting down the air conditioning requirements. I was impressed with the garden and the “healthy” vegetables that were grown. Watering in the garden was done with drip irrigation. But obtaining a loan for such an unconventional house was not easy. Anjali faced major difficulties. The Bank wanted not an Eco House, but a house built with concrete and the “usual” stuff. Anjali told us that the house was built such that it would produce least amount of the waste, in the event the house was to be demolished and rebuilt! I was amazed that so much thought was given considering the life cycle. Everybody in the family spoke about the house and had something interesting to tell. I was impressed to experience this “family project”. We had a good fortune to meet the construction contractor and two young architects from Khalapur. I could see that building Anjali’s house had transformed them – they not only could visualize the importance of sustainability but learnt how to implement the elements into a form with functionality by making a wise choice of materials. I was happy to know that Anjali and her architect friends are now documenting the project’s story. Anjali’s parents live in this Eco House. Indeed, they were practicing science with traditions, using less resources and making least waste possible with all the humility and simplicity that nature wants one to be. The silence around told us that this was sustainable living. I felt envious. Anjali’s mother read out a few poems in Marathi that expressed her love towards nature and her deep understanding of sustainability. When I returned home, I took out the toy clay house from the chest of drawers. This was the toy house that we made as an afternoon family project years ago. “Wish we build a real house together one day” I sighed. I was inspired by Anjali’s family project of the Eco House. I decided to call for a Skype session for this Family project. As usual, I thought I will advise – because I knew that was the only thing I could possibly do! This article was so wonderful and inspiring. It has been appreciated across my network. Thanks Dr Modak.